Chevy’s Silverado is an extraordinarily capable full-size pickup truck. That’s probably why it sells in equally extraordinary numbers. But for some people, it’s not quite capable enough. For these extra-demanding types, there’s also the Silverado HD. The HD is short for Heavy Duty, which means it does everything the regular Silverado does, and more. Until now the Silverado HD has been a “beefed-up” version of the regular truck. It tows more and carries more but has the same mechanical origins. That will change with the 2020 model year Silverado HD. To be precise, the regular truck should be called the Silverado 1500. That distinguishes it from the 2500HD and 3500HD. Think of these three as Big, Bigger and Badder, and Baddest of All. A new Silverado 1500 launched in 2018, taking what was an already impressive vehicle to the next level. In particular, it offers the largest box volume in its class and also the greatest usable width. It comes in eight trims and with a choice of engines and transmissions. Equipped with the 6.2-liter gasoline V8 it will carry a payload of over 1,000 kg and can tow up to 5,443 kg. In short, it’s a bit of a beast. For those who want more from their Silverado—well that’s why there’s the 2500 and 3500. These trucks offer slightly more space in the box and significantly higher payload and towing numbers. 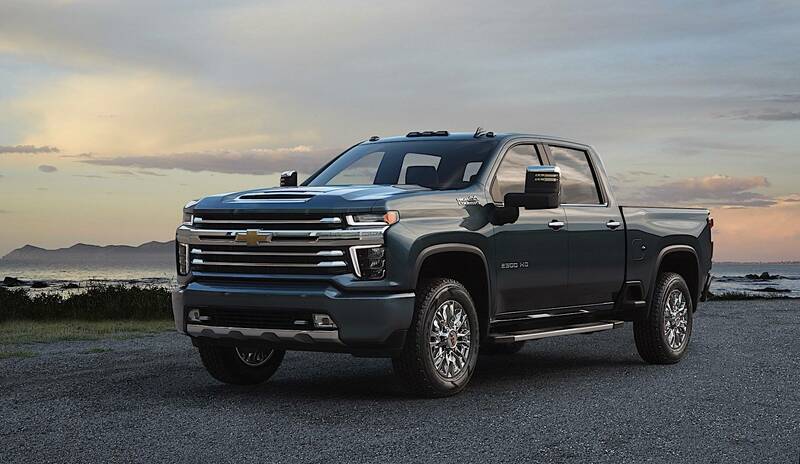 More specifically, depending on exact specification and equipment, with a 2019 Silverado HD you can carry up to 2,772 kg or tow as much as 10,478 kg. Chevy hasn’t published all the details yet, but we know a few things about the new truck. It’s big and tall with a huge grille to really announce its presence. It’s also still very much a Silverado, with styling cues carried over from the 2019 Silverado 1500. Despite that though, it shares almost no mechanical components with the smaller trucks. We also know that it will be available in five trims, from the rugged and basic Work Truck up to a luxurious and chrome-laden High Country. There’ll be a lot more legroom in the Crew Cab models and a new, though as yet unspecified, direct injection gasoline engine. Most exciting though—for those of us who love big trucks, anyway—is news about the diesel engine. Chevy assure us the 2020 Silverado HD will get a Duramax turbocharged diesel V8 mated to a 10-speed Allison transmission. The quoted torque on this is an astounding 1,234 Nm. If you need to pull a tree stump out the ground, this would be the truck to use. If you like a pickup truck for the styling, high seating position, and the ability to throw mountain bikes or a few tools in the back at weekends, this probably isn’t the truck for you. Stick with the Silverado 1500. It’s a great truck and it will serve you well. The Silverado HD is aimed at people who will make their truck work. It’s for the guys who need to tow a trailer of classic cars (note the plural,) across the province or across the country. It’s for the construction company boss who needs his truck to haul gravel one day and sacks of cement the next. Landscapers will use it, not for carrying away rose bush clippings, but for delivering scenic boulders, railroad ties and bricks. If it helps, think of the HD as not so much a truck as a work tool. And if you need the strongest, most rugged tool you can find, find your way down to Budds Chevrolet and let’s talk Heavy Duty.